Are you planning to start your own fund raising website to raise money for various categories? Then you can choose our readymade crowdfunding script to start your own fund raising sites like kickstarter, indiegogo, gofundme etc. Our script is designed in a manner to launch your own crowd funding website within minutes without much effort. 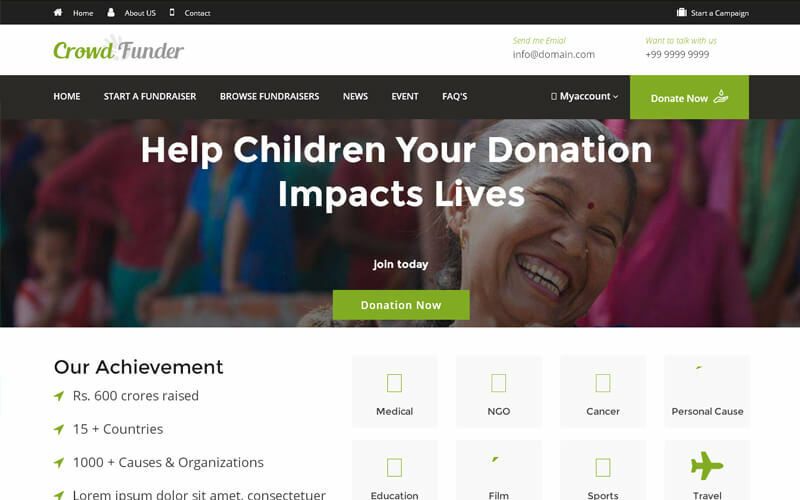 This fully featured fundraising script is developed using Word Press CMS according to the entire essential requirements and features needed for a Crowdfunding website. Our readymade crowdfunding script is easy to allow crowdfunding website with latest CMS and wordpress 4.0.1. Here without much technical knowledge the user can easily submit their funds and can set their goal amount for expected duration. Our script has an option to submit images, videos and wait for admin review once they submit their needs. Admin can easily manage all the pending post based on the terms and conditions and approve in secure way with pay pal payment gateway integration. Our Kickstarter clone script is very clear, has a user-friendly and responsive design which fits for all the devices. You can use our script for technology, fashion, charity, movie and anything else which you think. This script was like a Rocks and user friendly, highly customizable. Extremely flexible and the developers are on top of updates and adding the newest features. If you can dream it up, you can build it with ***! Absolutely love this script. I have to say I’m surprised this is 2nd most popular/purchased script because I’ve used the 1st and crowd funding script wins hands down. A fantastic script with excellent developers to behind the customer service is also fantastic. I absolutely love this script. This script is so easy to use, customize and the document is exceptional. Keep up the good work team! !